The Judce is the sicilian Mr. Massimo Inzoli, with us we have Piccolo, Mariolà and the little Pina..
Piccolo is 1st excellent in Champion class Cacib and bes eccellente in classe campit male..
the little Pina is 1st in Junior class. 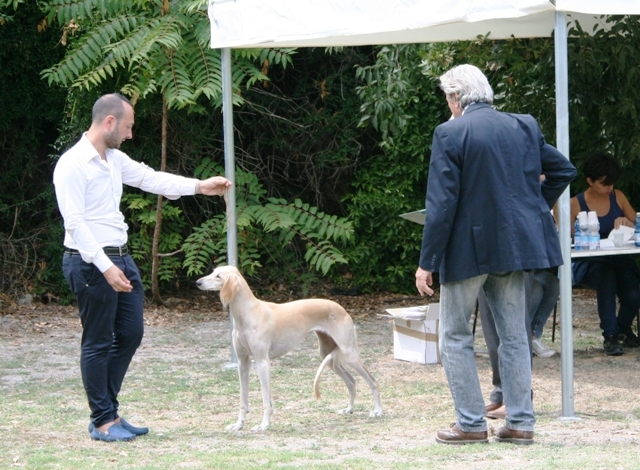 The exhibition is also special show for Greyhounds and most important is the result of our Saluki Asia that is 1st excellent in open class CAC,CACIB and best female and she became Italian Champion ...! A big thank goes to our friend Vincenzo Puntone for the excellent and professional handling. Great satisfaction in the main ring, where dell'Ovo kennel is the second best Breeding group of the exhibition..!! A great day spent togheter with many our friends, especially Cesare and Ada, with Francesco and Alessandro, who come to visit us from the center of Italy with their Saluki Argo, brother of our Asia..